On the eastern plateau of West Seattle (east of Delridge) is the neighborhood of Highland Park. It is nearly all flat with well kept homes and a few fixer-uppers sprinkled in every few blocks or so. There is real opportunity in this neighborhood, which has enjoyed significant appreciation in recent years, and is being discovered by professionals and blue collar workers alike. 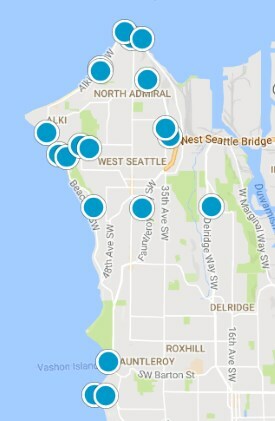 Those who love West Seattle, but still want some money left over at the end of the month to save or to enjoy, buy here, and so do investors. There are many single story homes here along with two story and split level homes. Commuting is convenient by driving down to West Marginal to get to downtown Seattle, or to Highway 509 to travel south. More for the money is what one gets here. If one neighborhood in West Seattle stands out as an artist community, it is Pigeon Point. As North Admiral sits at the northwestern end of West Seattle, Pigeon Point sits at the northeastern end - facing the city, providing the lucky residents with views of the city and Elliott Bay. The area is not large, but still plenty big to give buyers choices in homes. Listings in Pigeon Point are not plentiful though, so one has to stay on the lookout. Pathfinder Elementary School is here, serving grades K-8. Just south of the community of Pigeon Point is Puget Ridge where one can find a diamond in the rough for the price of a more common gem. Puget Ridge is still in the up and coming stage, but I believe the time is near when things will heat up. Kids are out playing and riding bikes, and neighbors are busy chatting with each other. Builders have discovered the area recently and are busy tearing down and building up. And commuters walk down to Delridge to catch the bus downtown. The reputation of Delridge has been a bit tough in the past, but things are changing. For one thing, a large percentage of the homes along the main Delridge thoroughfare have been replaced with nice new townhouses, which are also quite reasonably priced. And features such as community pea patches, soccer fields, serene nature paths through the watershed, and quick commuting both north and south are all advantages here.